The 1950s are reckoned to be the golden age of the steam railway in Britain and this album focuses largely on that period from a Cumbrian perspective. 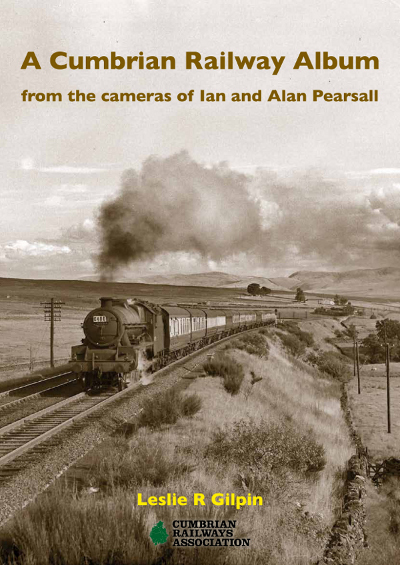 Ian Pearsall was a noted photographer of both railways and shipping whilst his brother Alan was a highly regarded historian, known mostly for his work at the National Maritime Museum but with a keen interest in railways. Although Yorkshiremen by birth, their family home moved to Morecambe and thus their appreciation for Cumbria developed. In this book, Furness Railway enthusiast and former CRA Chairman, Leslie Gilpin, has provided informative captions to a wide selection of the brothers’ photographic work. These stunning photographs not only record a time now past but also emphasise how the railway blended into the wonderful Cumbrian landscape. Chapters are geographically arranged, with additional focus on stations and structures, the Lindal ore trains and the railway junction at Foxfield. A Cumbrian Railway Album will appeal equally to railway enthusiasts, modellers, historians and those interested in the golden days of steam. Colour maps accompany the areas covered. ©Cumbrian Railways Association - Registered Charity Number 1025436.